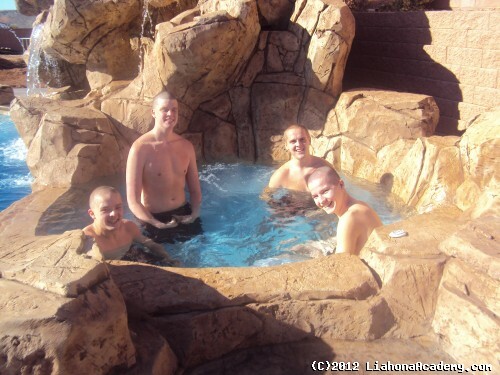 Liahona Academy is a residential treatment center for adolescent boys with anger management issues. We provide very effective strategies of discipline and love to combat circumstances relating to anger, rebellion and other problems troubled teens face today. Our therapeutic services offer many opportunities for successful behavioral treatment, and year round schooling with grade repair and credit recovery. Parents, if you have a child that is suffering with anger management or other related issues, please call Liahona Academy at 800-675-8101 for further assistance. Adolescent boys, like the rest of us, experience anger from moderate annoyance to rage. We actually experience it quite frequently each day. Anger is part of a generalized alarm reaction preparing us to solve a problem. However, when our anger grows toward a rage, we lose our ability to reason logically. Then, we make responsive decisions, which are immature and childlike. Anger is a natural response to emotional reactions when we are in situations where we feel threatened. There is nothing abnormal with your child when he is feeling angry. It is important to notice the differences between being angry and how a person behaves when they are angry. The problems begin when the actions conflict with the capacity to reason. The way we act when we are angry may be adverse or harmful to ourselves and others. There is also a damaging threat when we try to restrain our feelings because the root problem is never addressed, which can play a significant part in creating adolescent depression and other significant issues. A lot of times, Adolescent boys learn anger behaviors or anger management strategies in their homes and schools. But, the allowance to be angry to the point of violence should never be granted. Instead, try to manage anger so it can become a more positive emotion. The following are some ideas: relax, think positively, identify the problem and solve it, communicate instead of jumping to conclusions, manage stress by listening to music or writing, exercising and meditating. Other ways to manage would be to talk about your feelings with someone you trust or change your environment with new friends, etc. The professionals at Liahona Academy have researched the cause and process of anger to develop a program that teaches adolescent anger management strategies for preventing this problem from escalating out of control. Parents, if you have a child that would benefit from this unique program, Liahona Academy can help. Please call our Admissions Specialists at 800-675-8101.